-show development of knowledge, conceptual understanding, transdisciplinary skills, attitudes and attributes of the learner profile over a period of time. Portfolio entries should document both the process of learning and the product, including images and evidence of students in the process of constructing meaning. By using Google Sites for our portfolios we are able to provide the opportunity for authentic embedding of ICT across the curriculum. Classroom and specialist teachers are collaborating together with the students to show evidence of their learning. Students are using ICT to create their learning space, communicate their learning with others, organize their evidence into portfolio entries, and demonstrate they can be responsible digital citizens through their online presence in the portfolio. We have just started our school year, but I already see the students understanding the value of the portfolios as a continual process for their learning. And by linking their portfolios to our class blog, they are learning as part of a broader community of learners and gaining an authentic audience for their sharing. All of our students in G3-G5 have Gmail accounts. 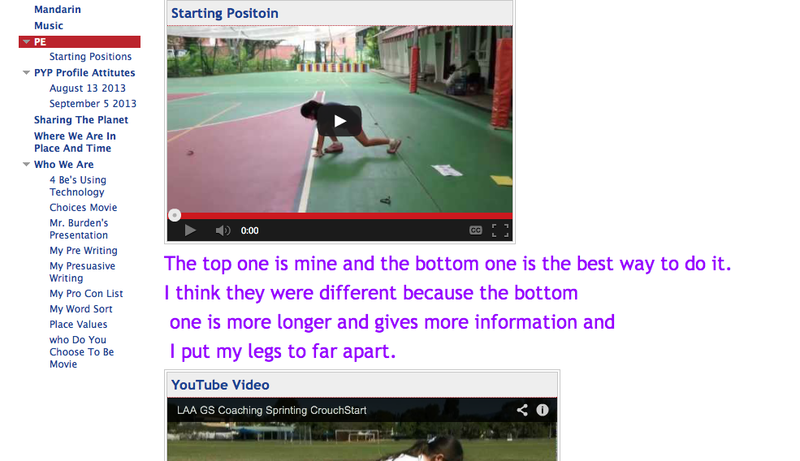 We use open class blogs and open student portfolios. How are your students using portfolios? This entry was posted in assessment, integration, PYP, PYP Attitudes, PYP Profile, technology and tagged assessment, choice, expectations, portfolios, PYP, technology, units of inquiry. Bookmark the permalink. Our students all have gmail accounts with the school name. 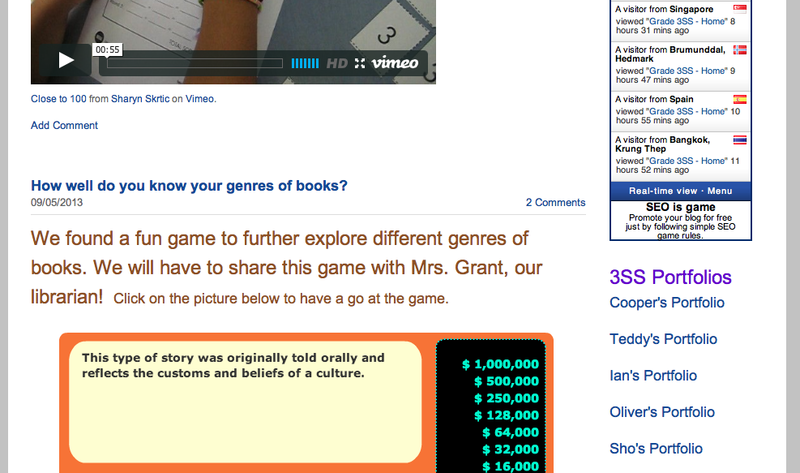 Through the Google suite, they have Blogger individual blogs for most classes 3-5. Blogs are all invitation only. 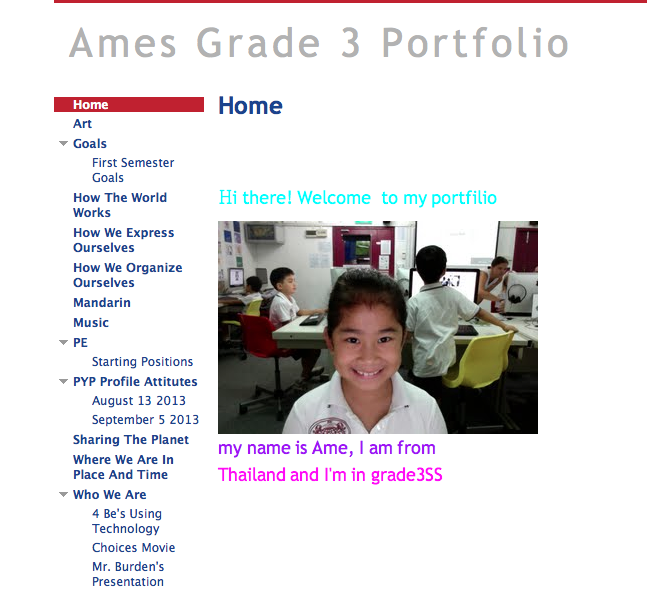 Last year we did our first e-portfolios using Google Sites. These are also invitation only outside of school. Students made statements about their learning in the e-portfolio and then linked the evidence to support those statements. As a pilot, we let students decide how to organise their material, so we had a variety of “topics,” subject specific, inquiry units, school values and school dispositions. Giving that freedom encouraged thoughtful organisation, and we weren’t disappointed. We started this about halfway through the year. This year we’ll start much earlier. Thanks for sharing what you do with portfolios. I like giving the students freedom to organize their material and choose some entries on their own too. The Google site portfolios sound great! What will you do when a student leaves the school to ensure they have continued access to their portfolio? Right now Megan, we are allowing leaving students to keep their email addresses (and everything that comes with it). We may add -ALUMNI- to their user account or something along those lines. Thanks for this post. Curious as to what your K-2 students use for the portfolio process. We are piloting digital portfolios this year, but having trouble deciding if we’ll have our primary grades participate in the pilot. Thanks!